Golf is a beloved game, played by people of all ages. 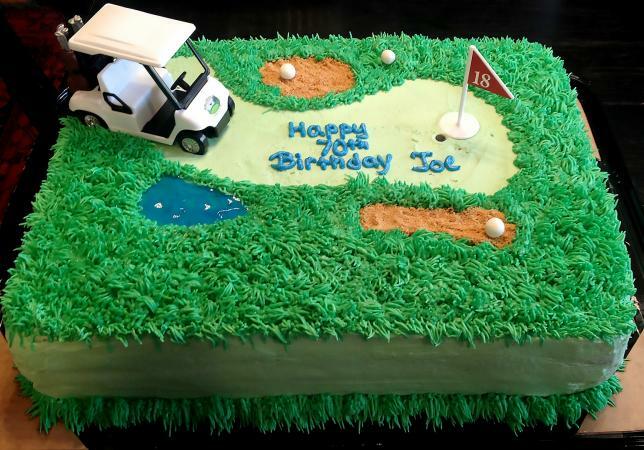 For a birthday, Father's Day, Mother's Day, a retirement party, and many more occasions, a golf-themed cake can be a great way to celebrate. Bring the excitement of the links to the party with some of these desserts. For a more refined black-and-white color scheme, this cake can serve a crowd seeking an elegant golf-themed dessert. 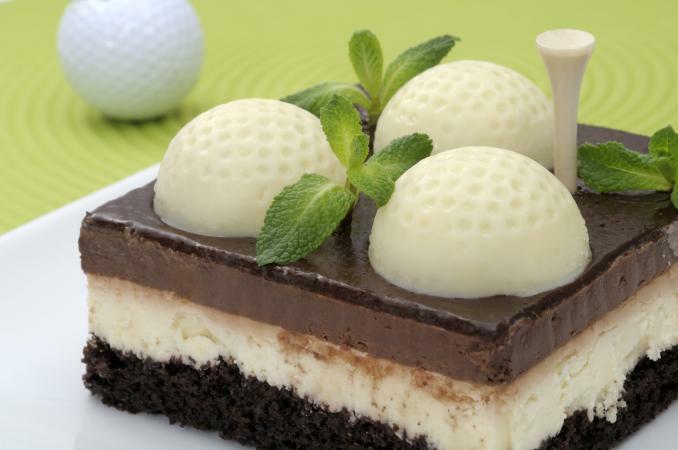 Topping a sheet cake with decorative white chocolate golf balls is sure to be a hit with guests of all ages. Incorporating chocolate work and a ganache frosting, this cake is good for either beginner or intermediate decorators looking to try something new. Start by making 24 golf ball halves. Melt the white chocolate candy melts in the microwave in short bursts of 10 or 15 seconds at a time, stirring between heatings. When the chocolate is warm and soft, pour or spoon it into the molds. Place the chocolate molds in the fridge for 10 minutes, but not much longer. The chocolate needs to set up, but if left in the cold too long, it can crack or "sweat" and discolor. Gently bend the mold to release the chocolate golf ball halves and set aside on a plate or tray. Sheet cakes are often served from the tray they were baked in, which works very well for this cake. Let the ganache set up for about 5-10 minutes after making it so that it isn't too runny. Carefully pour the ganache over the cake surface, doing your best to distribute it evenly across the top. Use the offset spatula to even the ganache out. Let the ganache cool for another 5-10 minutes before placing the 24 golf ball halves evenly across the surface of the cake in 6 rows of 4. This way, each slice will get a golf ball. Finish the cake with some of the fresh mint sprigs and the wooden tees for decoration. Using a handy icing tip to recreate the look of grass in buttercream frosting, this cake is sure to be the life of the party. This grass technique can also be used to decorate individual cupcakes and turn them into a putting green. This is a great technique for a beginner to intermediate decorator. Place the first rectangular cake on the cake plate and frost the top with a small amount of buttercream. Add the second layer of cake on top. Divide the buttercream into two bowls. Mix one portion with the leaf green color. Mix the other portion with the kelly green icing color. Frost the entire cake in a layer of the leaf green buttercream frosting. Make two small "sand traps" by sprinkling the graham cracker crumbs in oblong shapes on top of the cake, using the photo as inspiration for their placement and size. Place the icing tip #233 in the bag (using the standard couplers to lock it in place) and fill the bag about halfway with the kelly green frosting. To make grass, hold the frosting bag vertical, with the tip just touching the surface of the cupcake. Squeeze the frosting bag gently and draw it straight up, using steady pressure, until the grass is about ½-inch tall. Stop applying pressure and pull the bag up and away - you can pull up straight for very neat grass or at a slight angle for a more natural look. You can also let it go a bit longer to make it look more like the grass in the rough. Cover about two-thirds of the cake in grass, using the photo for inspiration as to its placement. It should go on the outer edges of the cake's top, leaving the lighter green fairway open. Leave a small, irregularly shaped oval space for what will soon be water. Surround the graham cracker portions, using the grass to cover up and rough edges on the outer edge if the crumbs look messy. Leave the sides of the cake blank, but cover the bottom edge of the cake in grass all the way around. Fill in the small remaining space with the blue gel to make a small water element. 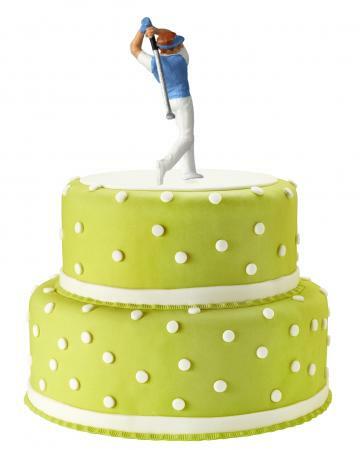 Place the cake toppers on the fairway, using the picture for ideas about their placement. If the occasion calls for a handsome tiered cake with a golf motif, this design is sure to please. Covered in green fondant and white circles, and topped with golf miniature figurines, it'll be a hit with all party goers. This fondant-heavy design is a good choice for intermediate or advanced cake decorators. Cut each cake in half through the center to create two even layers from each cake. Place one 8-inch round cake layer on the 10-inch cake board. Cover the top of it in a layer of frosting and then place the second cake on top of it. In the 8-inch cake, place the 4 dowel rods several inches in from the edge of the cake. Be sure to place them so that the 6-inch cake being placed on top of them will hide the dowels. On the 6-inch cake board, repeat step 2 with the 6-inch cake. Crumb coat the 6-inch cake. Wearing the gloves, place 1 package of the fondant and a few drops of the leaf green color in a small bowl and mix the color in by gently folding the fondant over itself until the color is evenly distributed. Dust your workspace with a little powdered sugar and roll the green fondant out into a large circle until it is a little less than ¼-inch thick. Use rolling pin spacers if desired. Use the rolling pin to pick up the fondant by laying it at one end of the circle and laying the edge of the fondant circle over the top of the pin, then rolling the fondant up by wrapping it around the pin. Move it over the 8-inch cake and carefully unroll it over top. Gently smooth the fondant over the cake top and sides, carefully and gently pushing any air bubbles down and out of it. It stretches slightly, but don't pull on it! Just gently smooth it with your gloved hands, leaving about ½-inch of it hanging off the bottom, trimming the edges as needed. Repeat steps 9-11 with the 6-inch cake. Carefully place the 6-inch cake on top of the 8-inch, in the dead center. Using the white fondant, roll out a circle approximately 6 inches across. You can create a compass using some string and a small knife like this to make it look perfect. Fill the frosting bag with a few spoonfuls of the buttercream. Use a few dots as glue to place the white circle on top of the 6-inch cake. Roll the rest of the white fondant out into a large rectangle. Use the ruler and cutter tool to cut two 1-inch high strips of fondant, each long enough to wrap around the base of the cakes. Also, using your small circle cutting tool, cut approximately 90 small circles. Using the buttercream, glue the the strips around the bottom borders of the cake, hiding the seams at the back of the cake. Glue each of the dots down in a random pattern around the sides and top edges of each cake. Place the cake topper on the top center of the 6-inch cake. 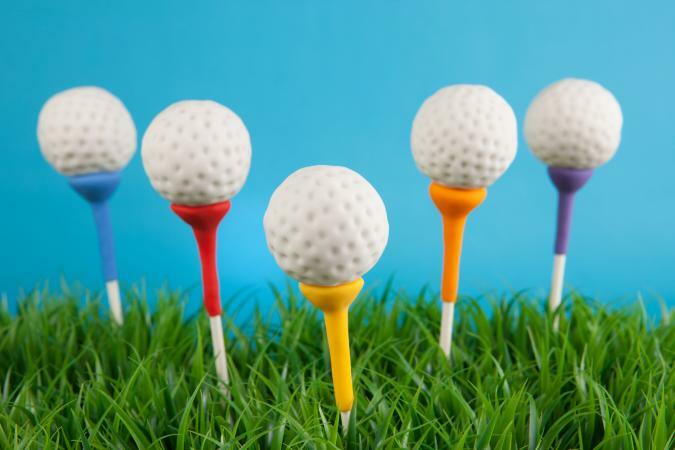 Create golf ball cake pops by covering cake pops with white fondant and making indentations with a toothpick or skewer. Hand sculpt a golf tee shape from colored fondant around the cake pop stick. On the sides of any cake, you can create an argyle pattern out of fondant and buttercream. Cut tall diamond shapes just a little shorter than the height of the cake and place them around the cake's outer edge, with the diamonds just touching one another. Then take an accent color of buttercream frosting and draw just the outlines of diamonds offset from the fondant ones. Check out argyle patterns for color and design inspiration. Use a 3D sports ball cake pan set to make either a half or a whole golf ball. Crumb coat and then frost the golf ball with vanilla buttercream. Take a teaspoon measuring spoon and dip the bottom bowl portion in water and then gently press that spoon bottom into the frosting. Use this to make indentations all over the surface of the golf ball. Be sure to dip the spoon back in water every time before pressing it into the frosting. With so many inspiring golf-themed treats to choose from, you're sure to impress any crowd at your upcoming party. Mix up some green frosting and get to making an edible green today.